The Fractured Republic: Renewing America’s Social Contract in the Age of Individualism can stand on its own, but I would recommend reading The Great Debate as well. The Fractured Republic is refreshing. Levin is a conservative, but that does not keep him from correcting his conservative kin, especially on fueling an expressive individualism that is just as toxic as those on the Left. Levin believes that conservatives who appreciate the importance of “mediating institutions” like families, communities, and religious groups, is where promise for a better political climate moving forward resides. Levin rightly sees both conservatives and liberals falling prey to nostalgia, a longing for a bygone era where things were so much better than the present. Both sides need to disabuse themselves of nostalgia in order to see their way forward in making wise decisions in a culture that is different from the past. This entry was posted in Book Review, Politics on July 28, 2017 by Dave. NOT HEADING FOR THE HILLS! Scholars are rarely prophets and prophets are rarely scholars. 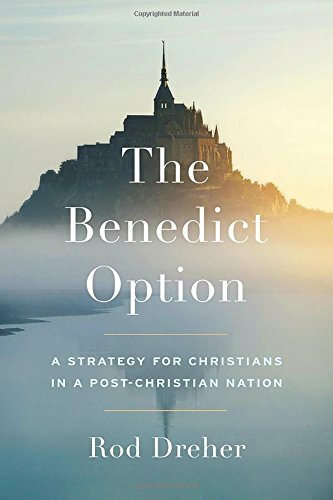 I was reminded of this in reading the much debated, The Benedict Option by Rod Dreher. Rod Dreher, journalist and outspoken Christian, is decidedly on the prophetic side of the scholar-prophet spectrum. This, however, does not mean that he is incapable of helping us better understand the far-reaching and practical ramifications of something as arcane as nominalism. We must say right out of the blocks that Dreher’s book is not a jeremiad screed to head for the hills. Rather, Dreher advocates for “exile in place.” The preposition is key. We are to cultivate faithfulness with other like-minded folks not simply to hunker down in our religious enclaves. We should form these counter-cultural communities to strengthen our capacity to engage, not escape, our world. This is a clarion call by a gifted writer to let the church be the church. I have my disagreements with some of Dreher’s analysis and antidotes. With respect to the former, Dreher is insufficiently aware of what the Protestant Reformers meant by sola Scriptura. As Keith Mathison memorably puts it, sola Scpritura does not mean solo Scriptura. Among other things, leaning on the thesis in Brad Gregory’s Unintended Reformation made for a potted history. Dreher would have been greatly helped if he had availed himself of the work of either Mathison or D.H. Williams, especially his Retrieving the Tradition and Renewing Evangelicalism: a Primer of Suspicious Protestants. As to antidotes, I don’t share Dreher’s sweeping denunciation of public schools. For the record, our two sons attended Christian schools, had a few years of homeschooling, and went to public high schools. All three have their strengths and weaknesses. Sure, public schools can be a mess. I saw incompetent teachers and weak administrators, but I also saw bogus rules, unprincipled administrators and mean teachers at the Christian school. My experience, it needs to be noted, was both as a parent and a part-time teacher. Dreher is rightly concerned about the corrosive effects of “moralistic, therapeutic, Deism.” I share his concerns. I also share Dreher’s conviction that “losing political power might just be the thing that saves the church’s soul.” As many have said, the church seems the most vital (and prophetic) when it works from the margins of power. Notwithstanding its shortcomings, Dreher’s book is a good reminder of that reality. 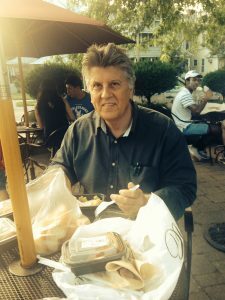 This entry was posted in Book Review, Christianity, Culture, Politics on July 25, 2017 by Dave. NOT JUST FOR POLITICAL JUNKIES! The modern notion of “politics” is much narrower than the ancient one. The modern idea thinks mainly of things like voting, lobbying for favorite causes, and those who govern. Levin shows us in his terrific book that there is much more to politics. For example, one’s understanding of human nature and history dramatically affect how one understands political change. So-called progressives and so-called conservatives are given much to think about in this fine work. Since I am late to the party in reviewing this book, let me close with one massive implication that came to me in reading this book and it deals with Christian theology. 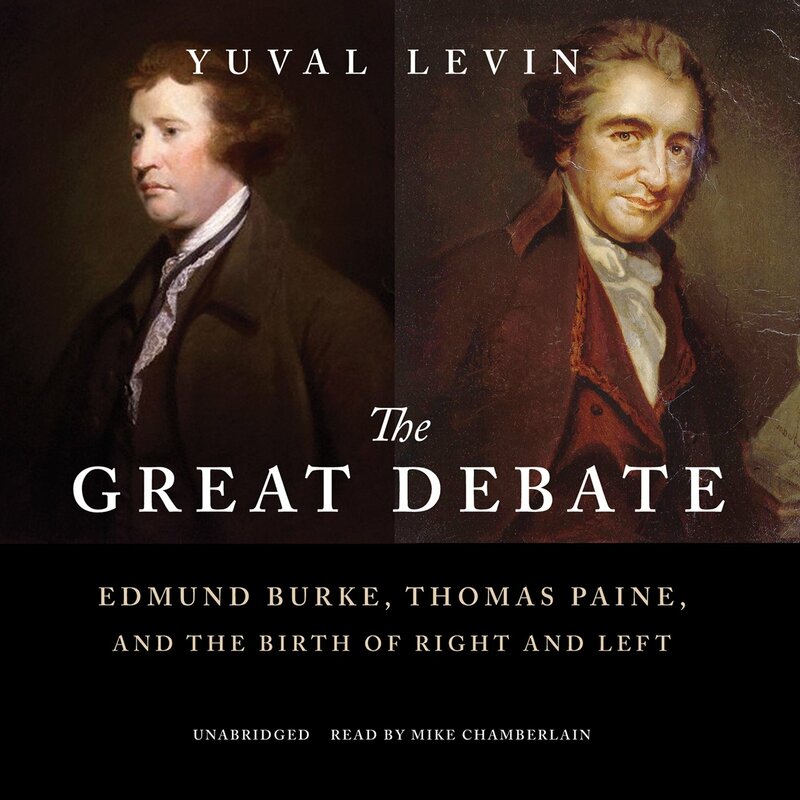 For those of us Christians who gladly hold to more conservative or orthodox (small o) theology, there is something terribly important we can learn from Edmund Burke. Burke believed that the best of tradition is true, but to convince more radical types like Paine, it was crucial to also show the beauty of tradition. If I were to grade us conservative Christians on how well we do in showing the beauty of truth, I would give us a very low grade. Carefully crafted doctrine is essential, but it needs to shine forth as beautiful. This entry was posted in Book Review, Politics on July 20, 2017 by Dave. The Beinecke Rare Book & Manuscript Library at Yale is one of the world’s best. Unlike Harvard’s collection, you don’t need to wear white gloves. Once we were vetted, we were shocked by the freedom they give to scholars. 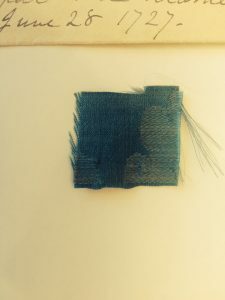 Here are a few things we looked at. First, is Jonathan Edwards Bible. Paper was rare, but Jonathan liked to write…a lot. You will see that the small sheet has the passage of Scripture and then two blank pages to take notes on what he was reading. And did he ever take notes! I did somewhat of a quick count of his handwritten notes on Genesis and each page has about 2500 words! On a similar size sheet of paper I write about 250 words. Jonathan’s wife, Sarah, along with their daughters, made fans. 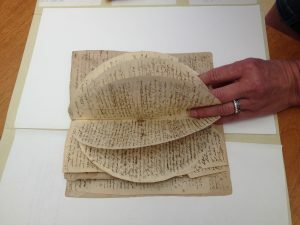 When the fans were no longer of use, Jonathan would take the delicate scraps and weave them into a book where he could write down sermon notes, etc. Doreen got choked up when she held Jonathan’s Bible in her hands. The word that kept coming to my mind was “humbling” as you see the great effort Jonathan exerted to make sense of God’s Word. Fabric from Sarah’s wedding dress. Our dear friend, Dr. Dave Mahan, is the director of the Rivendell Institute (www.rivendellinstitute.org) and teaches at Yale Divinity. 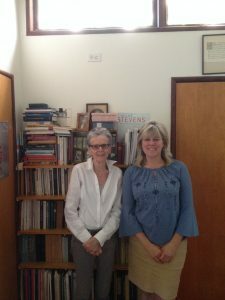 Dave set us up with Susan Howe, who is a world-renowned poet. In 2017, she won the Robert Frost Medal for “distinguished lifetime service to American poetry.” Susan was a sheer delight to be with. We spent two terrific hours at her beautiful home in the country. 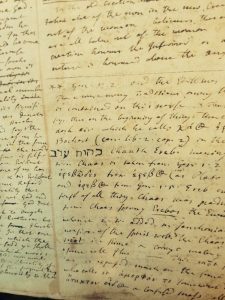 Susan is candid about not being a Christian, but she is captivated by the beauty and respect for language she finds in Jonathan and Sarah Edwards. I headed over to Yale’s Sterling library and was thrilled to see they have my first book. 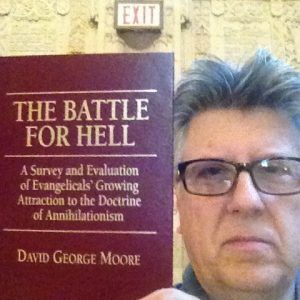 Michael McClymond is Professor of Modern Christianity at St. Louis University. Doreen met Mike in college some thirty-five years ago! She had not seen Mike since, but he happened to be at Yale the same time as us. Mike told us about his various writing projects, one of which he happened to remember quoting my book, The Battle for Hell. Mike is a wonderful guy, expert on Jonathan Edwards, and graciously offered to be a resource for Doreen with her book on Sarah. The great folks at the Overseas Ministries Study Center made our time fun and fruitful. Many thanks to Dr. Tom Hastings, Pam Huffman, Pam Sola, Michael Racine, Ray Sola, Judy Stebbins, and the ever present help of Chee-Seng and Sharon! Check them out at www.omsc.org. I will close with a foodie picture. This is Nica’s Market (www.nicasmarket.com), a terrific and reasonable place to grab a bite (or many bites!) to eat. The guy behind me seems skeptical about my choices, but trust me, they were good. 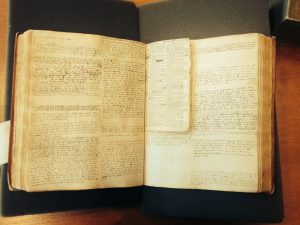 This entry was posted in American History, Christianity, Jonathan Edwards, Learning/Education, Spiritual Life, Writing on July 17, 2017 by Dave. It’s no secret that reading is good for you. Just six minutes of reading is enough to reduce stress by 68%, and numerous studies have shown that reading keeps your brain functioning effectively as you age. One study even found that elderly individuals who read regularly are 2.5 times less likely to develop Alzheimer’s than their peers. 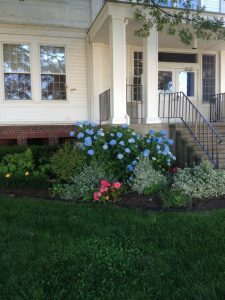 This entry was posted in Reading on July 13, 2017 by Dave. Years ago, while I was on faculty at the University of Nottingham, a colleague and I used to play a game with the students. We would give them a quiz consisting of paragraphs drawn from great theologians and philosophers, which they had to attribute. In every quiz we included one paragraph of complete gibberish, which we had made up ourselves over a pint of beer in the faculty club. Words such as “alterity,” “the Other,” and “subjectification” abounded, along with nouns used as verbs and a plethora of hyphenated neologisms and random capitalizations. The students never failed to attempt some kind of attribution (Paul Tillich, I think, was usually the most popular) and to profess admiration for the depth of thought and insight contained in the paragraph. This entry was posted in Scholar/Scholarship on July 13, 2017 by Dave. This entry was posted in Controversy, Politics, Speech on July 12, 2017 by Dave. 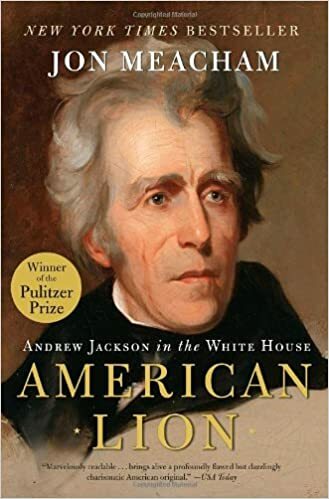 I’ve read several good books about President Jackson. None have been duds. All of them taught me fascinating and important things about Jackson. Jon Meacham combines some of my favorite features for biography: wonderful wordsmithing, lucid prose, an eye for the salient details, and a nose for smelling out the proper drama. If you are looking for a terrific biography of Jackson, this is the place I would recommend. This entry was posted in American History, Leadership, Politics on July 11, 2017 by Dave. JUNTO: When we spoke, you stressed the importance of storytelling as a means of getting a variety of people interested in history. How does storytelling factor into the work that you do? How does it connect to your research and writing? BENDROTH: I invite a lot of academics to give talks at the Library—we have a monthly “History Matters” series that brings in a mix of people in our downtown area. I get twitchy when a presenter starts talking about “negotiating” and “complicating” and “constructing.” It’s not that these words are bad—they’re great at academic conferences and I love most of them dearly. But (and I’m overstating a bit) the people in our audience profoundly do not care. It’s not that they can’t understand the concepts—I’m sure most of them could—but that’s not why there are there. I think that, like most human beings, they are looking for connection. They want to hear about other human beings, other lives, stories that make someone from the past both totally foreign and utterly familiar. We should never forget that. I’m not saying that every historian has to be David McCullough or Doris Kearns Goodwin—would that we could sell that many books! But if we can’t explain our ideas in clear simple language that the average person, then we don’t really understand them ourselves. This entry was posted in American History, Learning/Education, Teaching on July 10, 2017 by Dave. The top three answers were take more risks, reflect more, and seek to invest in things that would last after I did. This entry was posted in Aging on July 9, 2017 by Dave.